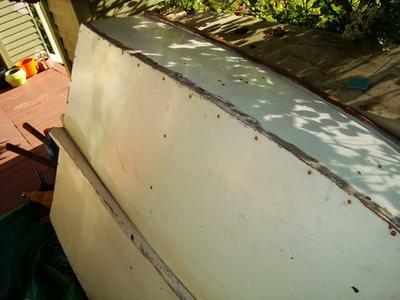 I have a very, very, small wood rowboat - 6 ft long. I bought it last May and have not put it in the water yet. It had probably been out of the water for a while. It has very few seams - the bottom on done in one piece of wood. But it looks like some of the caulking if coming out where the bottom meets the sides. Should I do something to get the wood to swell - like filling it with water or turning it upside down and covering the bottom with wet blankets and towels? Should I remove the old caulk? It looks like someone had done some caulking previously. What type of caulking do I use? Many of the post talk about cotton but I am not sure is that is correct for my tiny little rowboat. I have included some photos. Any suggestions appreciated. Thank you Bill and Michael for the more complete instructions. 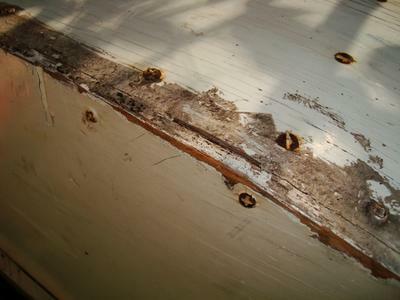 I did not see any evidence of fiberglass tape so thought the builder of this tiny boat had used a different method. @ Michael - yes, I think the boat is made of plywood. I will try the fiberglass tape method and see how it goes. 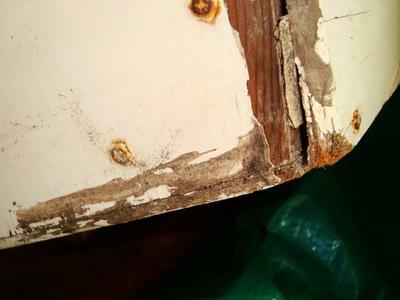 Those bits of 'caulking' look like someone has filled the cracks with a filler of some sort but not taped over them. When you sand off the paint round off (radius) the corners slightly so the glass tape doesn't have to go around a sharp bend. In which case the best remedy is probably Harry's suggestion, cover the joints with fiberglass tape held in position with epoxy resin. First thing you need to do is clean off the paint along the seams at least as wide as the tape. The boat needs to be dry before using epoxy. Fill any gaps with the epoxy thickened with either a proprietary thickener or something such as sawdust. Soak the seam with epoxy allow it to go tacky then lay the tape and spread epoxy over the tape to fill the weave. Not sure how this works because I don't really see a thread to follow. I appreciate the two suggestions to use fiberglass. But where would I find instructions for doing that? This is such a small, not-very-fancy boat I don't want to overdo on the repair. I had read about using marine caulk - would that be bad? Glass tape is the way to go. 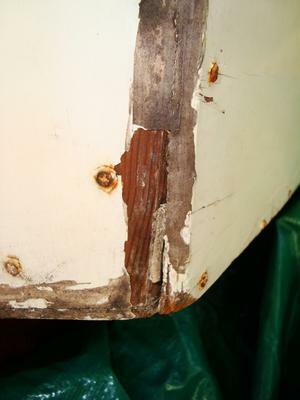 DO NOT wet the boat , you need to ensure that the plywood is dry to successfully apply the resin and tape. What about fiberglass tape? Would be a permanent and easy fix, I think.